Review: This one was so hard for me to review and give a rating to! On the one hand, I loved all of the main characters and the writing flowed so well I read this book in less than 24 hours. But it felt like it was just missing something. You know, that certain factor that would bump this up from an enjoyable read to an instant favorite? I certainly don’t have anything bad to say about this book. Jen Wilde does SUCH AN AMAZING JOB of writing inclusive characters. I’ve said it before and I’ll say it again, where were these books when I was growing up?? Sure, I’m a straight, white, cis-gender female married to a straight, white, cis-gender male and I grew up reading about those same types of characters, but how boring is that? I wish I could have read about Emmy and Alfie and Chloe and Ryan when I was a teenager. I’m so jealous of young readers today and the fantastic representation that I’ve been seeing more and more of in books. That’s not to say we don’t still have a ton of work ahead of us, because we do. But seeing books like this makes me so happy. It’s entirely possible that the thing I felt was missing was simply the age-gap between myself and the characters. I read a lot of YA, but most of the time it’s the fantasy genre, not contemporary. And fantasy characters can sometimes feel age-less, especially when they’re going to war or taming dragons. What I’m saying is, don’t let my “missing-something” feeling stop you from reading this book. Definitely pick this one up if you’re looking for more diverse reads, or if you enjoy YA contemporary, or books about punk/pop bands, or you just want a nice enjoyable read! 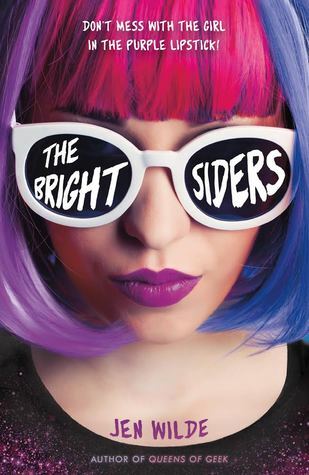 Thank you so much to Fierce Reads and Swoon Reads for sending me a copy of The Brightsiders to review! I’m not a huge fan of contemporary YA, but this one is calling to me! It was definitely a fun read and I need to check out more by this author!